This was one of the best weekends in College Football, as we finally have some clarity on who is going to be in the Top 4 at the end of the season. The Pac-12 is going to be on the outside looking in, while the Big Ten has one foot out of the door. Since there are only three weeks till the committee releases its rankings, I am not going to do my ten observations, instead I am going to break it into six different categories to give my thoughts on how the College Football Playoff is going to turn out. The categories will be for each of the Power Five conferences and the last category will be for the field which is teams like Notre Dame and other non Power five schools. Here are my thoughts on how each conference is going to play out. The ACC had the biggest win of the weekend. 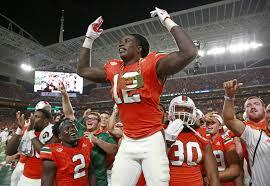 Miami thrashing Notre Dame all but punched the ticket for the eventual conference champion to go to the Playoffs. If Miami had lost to Notre Dame, but still won the title game over Clemson, then Notre Dame might have gone ahead of them, but that is no longer the case. The Committee is not going to put a 2-loss non Power Five team over a 2-loss conference champion, so if both Miami and Clemson take care of business in the next two weeks, then the ACC Championship game will turn into a defacto National Quarterfinal game. There was a chance that the ACC would be one the conferences that is left out, but the two teams in the Conference control their own destiny from here on out. The Big Ten is in a very weird spot, they are one of the conferences that has still not punched a ticket to the Playoffs, and will not do so until Championship weekend. The team with the best record in the conference, Wisconsin does not have a quality win on its resume, but has two big games coming up in the next three weeks. They play Michigan this weekend and will most likely play Ohio State in the Big Ten Title game. If Wisconsin wins both those games and is undefeated in the regular season, then they will for sure be in the Playoffs, but what if they lose? Will the committee put a 2-loss Ohio State team who’s quality win is against a two-loss Penn State team in a last second win at home or will they leave out they leave out the conference if Wisconsin is not undefeated. The committee has shown that it loves to put Ohio State in the playoffs, so there is always a chance they could get in if they blow out Wisconsin, but other things in other conferences would need to happen. The Big Ten as a whole to root for Wisconsin to run the table to guarantee a Playoff spot, otherwise they will have to root for chaos in the other Power Five conferences. The Big 12 is in a similar boat as the Big Ten but their picture is a little bit more clearer than Big 12. The committee has shown some bias against the Big 12 in the past, so I highly doubt a 2-loss Big 12 champion will get in. Oklahoma has the best record in the conference right now and it has punched its ticket to the Big 12 Title game barring a major upset against West Virginia on Saturday or Kansas the following weekend. The team that they will face in the title game is still up in the air technically. It could be TCU, Oklahoma State or West Virginia, however the tiebreakers favor TCU right now. If Oklahoma wins the conference as an 1-loss team then they will get into the Playoffs, but if they have a 2-loss team that they will be on the outside looking in depending on how other conferences play out. One thing that will be key the rest of the way is that Oklahoma beat Ohio State in Columbus earlier this season, so if both teams are 2-loss Conference champions than the slight edge would go to Oklahoma. The Pac-12 shot itself in the foot on Friday night after the two best teams in the conferences, both have two losses on the season. Washington lost to Stanford while being the only hope to get into the Playoffs. Washington and USC will most likely play each in the Pac-12 title game, so the conference champion will have two losses. Neither team has a quality loss, so unless there is a two three-loss champions, the Pac-12 will not be sending a representative to the College Football Playoff. Things could have gotten chaotic in the SEC but Alabama was able to take care of business. There were realistic possibilities that two SEC teams would get in but as Georgia was betting blown out by Auburn, Alabama was losing in the second half. For about a half hour on Saturday night, there was a chance that there would be no undefeated teams in the SEC. Alabama came back to beat Mississippi State and will be ranked #1 in the rankings that come out tomorrow. The SEC could still have two team get in, but it would be much harder than before. If Georgia beats Alabama in the SEC title game, then the argument of two 1-loss SEC teams are better than putting in a 2-loss Conference champion. For that to happen, Ohio State would need to win the Big Ten and most likely the Big 12 would also need a 2-loss champion. The winner of the SEC title game will get in, but there is a chance that another could get in somehow. The odd ball in the SEC is Auburn who has already blown out Georgia and plays Alabama in the Iron Bowl in two weeks. If Auburn beats Alabama and then beats Georgia again the SEC title game, will a 2-loss Auburn team get in over a 1-loss Alabama team? That would sure make things interesting in the SEC. The chances of a non Power Five team sneaking into the Playoffs are slim to none after Notre Dame’s loss to Miami. Notre Dame could have gotten in as a 1-loss team which came against Georgia, but having 2-loss basically ends their hopes of getting in. If somehow, the Big Ten and Big 12 have 3-loss conference champions and USC wins the Pac-12 then Notre Dame could possibly get in since they already beat USC this season. This scenario is so crazy that I might just stop watching sports if it happens. UCF is still undefeated on the season and they have like a 0.001% chance of getting the Playoffs. If three of the Power Five schools have a three-loss champion and Auburn wins the SEC, then they might just have enough to get in, again this is highly unlikely. It will be interesting to see how high UCF is ranked this week, if they are near or in the Top-1o then the chance of UCF getting increases to 0.003% from 0.001%. Those were the Playoff pictures in the six major conferences in the FBS. If someone put a gun to my head and asked me which four teams would get in, I would say that right now it would be Alabama, Miami, Oklahoma, and Wisconsin, but that could change in an hour from now and it will certainly change by the time the Selection Sunday rolls around, so check back here every Monday for the next three weeks to see my updated College Football Playoff picture.